Republican U.S. 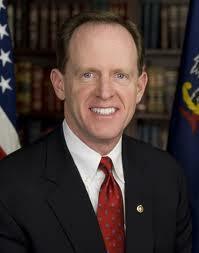 Senator from Pennsylvania Pat Toomey weighs in on the "Fiscal Cliff" issue. Recently, Senator Pat Toomey sent us this editorial piece, which discusses the impending "Fiscal Cliff" issue you've probably heard so much about. Below is that editorial, unedited, for your perusal. I agree with President Obama. No matter how much we raise taxes, we cannot avoid a fiscal disaster unless we address the true drivers of our out-of-control deficits – namely, our entitlement programs. The reality is that the federal government doesn't have a revenue problem. It has a spending problem. Over the past 10 years, federal tax rates have remained constant, while spending has doubled. Under current tax rates, we nearly balanced the budget in 2007. But recently, spending has surged to post-WWII-record levels even as a percentage of our economy. This spending explosion has resulted in massive, trillion dollar-plus deficits, casting a pall over our economy that continues to cost us jobs and growth. Meanwhile, our entitlement programs are growing at unsustainable rates, threatening ever larger deficits. In 10 years, three categories of spending – Social Security, government-sponsored health care, and interest on our debt – will consume nearly all projected tax revenue. Clearly, this is unsustainable. But we have an even more immediate crisis. Four weeks from now, our economy will take another huge hit if Congress refuses to act. On January 1, 2013, personal income tax rates that have been in place for 10 years are scheduled to rise dramatically. Every American taxpayer will be hit with substantial tax increases, and taxes on certain job-creating capital investments will double and even triple. This is the devastating part of the fiscal cliff that will plunge our economy back into recession and cost perhaps millions of additional jobs. My highest priority in the Senate has been to solve these urgent, twin challenges—restoring both sustainable fiscal policy and job-generating economic growth. The looming deadline presents Congress and the president with an opportunity to make real progress on both. First, we must recognize that elections have consequences. President Obama and a Democratic-controlled Senate have been re-elected, but so was a Republican-controlled House of Representatives. Solving these twin crises will require Democrats and Republicans to work together. Both sides will have to give some ground. I don't want to raise taxes on anyone but the president is insisting on a tax increase, and, if nothing is done, a huge tax increase is imminent. That is why I have suggested we revisit the framework I first proposed in the Joint Select Committee on Deficit Reduction. The tax side of this framework would include new revenue from top earners provided it results from pro-growth tax reform that lowers marginal tax rates and offsets the lost revenue by limiting deductions, loopholes, and write-offs. This is exactly the manner in which Bowles-Simpson and every other bipartisan deficit reduction commission has recommended any revenue increase. Doesn't it only make sense that any revenue increase be done in a way that minimizes harm to the economy? Now, let's acknowledge that if the president gets the tax increase he campaigned on, that additional revenue will reduce the next 10 years' deficits by about 8 percent. To deal with the other 92 percent of the deficits, the president must agree to address the real problem—our entitlement programs. That brings me to the spending side of my supercommittee framework. While I would prefer to save our entitlement programs now by making them permanently solvent, the president and most of my Democratic Senate colleagues have rejected the necessary reforms to accomplish this goal. But can't we at least make some progress on this issue, which is the real problem we face? I have proposed a series of modest reforms, including slowing the rate at which some benefits grow and asking wealthy Americans to accept less generous healthcare benefits in their retirements. Some combination of these reforms would generate significant savings without undermining retirement security for seniors. I hope the president will seize the opportunity—and the requirement—of this moment. I hope he will reject the calls from those Democratic senators who have urged us to plunge over the cliff and others who have insisted that we just raise taxes now and discuss spending problems on some unspecified day in the future. That day never seems to arrive and the crisis is imminent. With only a month to go, we are quickly running out of options and out of time. I believe my compromise presents a bipartisan path forward and I remain hopeful Washington will come to its senses.